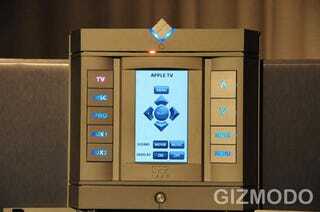 SE2 Labs let us have a look at the ITC One, an integrated movie, TV, gaming and music system announced last year. The all-in-one approach purports to simplify setting up a high-end home entertainment system easier by cramming everything you could imagine into an expensive box. The concept is interesting, but so is the $25,000 price. The system is beautifully assembled and impressively spec'd, but unless you've got that kind of money just floating around and don't know what Blu-ray discs are, this probably isn't for you. The obvious worry is that such a system will just be a pile of components, cobbled together with little regard for usability and ergonomics. The ITC One is not that. The company has combined an Xbox 360, Wii, Apple TV, iPod dock and a DVR with various audio/videophilic hardware in a relatively graceful manner, packing everything into an attractive aluminum case. Space is at a premium in this setup, so most of the internal components are stripped of their shells, and in some cases augmented (optical audio out is bypassed to connect straight to the S/PDIF connectors on the Xbox and Apple TV, and the Xbox gets a new heat sink and fan). Most of the hardware is plugged into a central supply, which ITC claims saves 50% power at idle and 33% during use over an equivalent traditional cabinet of hardware. Networking is shared, and the systems can be controlled with face-forward LCD or the all-in-one remote, which is simple and well designed, with motion sensitivity, 4-6 month battery life on 2 AA batteries with an Apple-esque charge indicator. It's also got a brilliant alarm that beeps when you press the "lost remote" button on the primary unit (honestly, this should be everywhere). For $25,000 though, we expect more than a clean build and clever remote, and there are some departments where the ITC One disappoints. First, Blu-ray is not standard. Seriously . If you are the kind of person who is planning on dropping this much cash on a home theater setup you probably expect to be able to play the dominant HD format. A BR player will be available as an upgrade, but you'll have to say goodbye to your precious Wii to make space. Second, it seems like a massive chunk of the hardware cost is for overpriced (and over-hyped) A/V hardware. The Vidikron upscaler, power conditioning hardware and aforementioned optical out bypass are all perfect examples of the cost-ineffective gimmicks that plague home theater today. You could buy all of the core hardware (Xbox, DVR, Apple TV, etc.) in here for less than $5,000, and it'd be pretty hard to justify the $20,000 premium for the slick presentation and under-the-hood hardware improvements. It's clear that a lot of thought has gone into the ITC One, and it took some inspired designing and engineering to cram all of this hardware into an attractive, usable box. The strange decision not to include Blu-ray by default (or even at all, at until they finish engineering it) leaves the One crippled, and the pervasive A/V hypeware pushes the price way out of reach for just about anyone, into the realm of professional theater installs. The ITC One is available now.